Peptide-copper complexes are disclosed which stimulate the growth of hair on warm-blooded animals. In one aspect of this invention, the peptide-copper complexes are dipeptides or tripeptides chelated to copper at a molar ratio ranging from about 1:1 to 3:1, with the second position of the peptide from the amino terminus being histidine, arginine or a derivative thereof. The peptide-copper complexes may be formulated for administration by, for example, topical application or injection. Any affliction associate with hair loss, including hair loss associated with both androgenetic and secondary alopecia, may be treated with the peptide-copper complexes of this invention. Methods and compositions for (a) stimulating the growth of hair in warm-blooded animals, (b) increasing subcutaneous fat in warm-blooded animals, and (c) increasing the density of hair follicles in warm-blooded animals are disclosed. The methods utilize an effective amount of a composition comprising a derivative of GHL-Cu. There is provided metal-peptide compositions for use as stimulating agents for hair growth in warm-blooded animals. Methods for stimulating the growth of hair in warm-blooded animals are also disclosed. The methods utilize a stimulating effective amount of the metal-petide composition or a pharmaceutical preparation containing the metal-peptide composition. Tricomin is a copper-peptide spray that delivers a specific copper/peptide molecule to the hair follicle stimulating its growth. Copper ion complexed with certain peptides (proteins) are known to have both skin repair and hair growth enhancement effects. Tricomin is a blue liquid spray that contains a patented copper-peptide molecule (Alanine/Histidine/Lysine Polypeptide Copper HCl), a molecule that has been formed by bonding copper ions to protein molecules. Developed by ProCyte Corporation, a publicly-held healthcare company specializing in copper peptide technology, Tricomin had its origins in a wound healing product. Researchers noticed that animals being treated with a copper peptide wound healing product were having their hair growth stimulated. This discovery led to the company to develop the Tricomin product as a specific hair growth product. Studies have demonstrated the positive effects of Tricomin's Triamino Copper Nutritional Complex on hair follicles. During the anagen (growth) phase, the base of the hair follicle (dermal papilla) is richly endowed with substances such as collagen and various proteins. These substances are virtually absent during the resting phase. Copper has been shown to stimulate the cells responsible for production of these substances. Tricomin works by targeting the delivery of copper to the base of the follicle. Tricomin was originally intended to be approved as a hair growth product by the FDA. The company did successfully complete the FDA Phase II trial, but due to financial constraints decided to not continue to Phase III which would have cost several hundred million dollars. The company instead decided make the product available as a cosmetic product thereby eliminating the need for further FDA trials, but this means they are unable to make any claims that the product regrows hair. However we do know that from the Phase II results that the subjects in the trial did grow a similar amount of hair to those who were tested in the 2% Rogaine trials. Tricomin works well on its own for treating fine or thinning hair, but in people who suffer from Androgenic Alopecia, Tricomin works best to compliment other therapies like Propecia or Rogaine. Think of Tricomin as nutrition for the follicle and that is what it does best, it also helps soothe an irritated scalp. Tricomin is also an alterative treatment for people who dont want to use a drug treatment like Rogaine. The company recommends using it at least twice a day. If you are using Rogaine or another topical its best to wait a few hours between applications since mixing the Tricomin with other products can cause the scalp to turn a greenish color, this is not permanent and washes out. 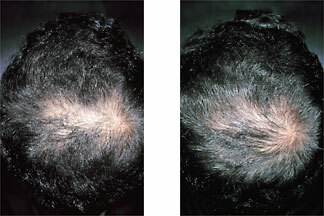 Tricomin is simply sprayed onto the scalp in the thinning areas twice a day. There are also shampoo and conditioning products available to complement the spray. These products do contain a small amount of the copper peptide but not in significant amounts and they are not recommend as a replacement to the spray but as an addition. For added value the spray and shampoos are available together, the Tricopack 1 consists of the Tricomin Spray, shampoo and conditioner and retails for about $76, the Tricopack 2 consists of the Tricomin Spray and a shampoo/conditioner in one and retails for around $59.00. As with all hair loss products Tricomin needs to be used regularly to maintain the results, but it is a good option for people who dont want a drug-based product but do want a product that has some science behind it. It is also ideal for people who have had results but want to add another product to their existing treatment program.